How To How Old is My Deer? Antler and body size can indicate a deer’s age, but physical characteristics are often misleading. The number of antler points in no way corresponds to age. Even if it did, it wouldn’t help in aging does, which make up a considerable proportion of the harvest each year. Antler size in bucks and physical development in both genders is greatly affected by diet and genetics, which may account for differences between animals of the same age taken from different locations. 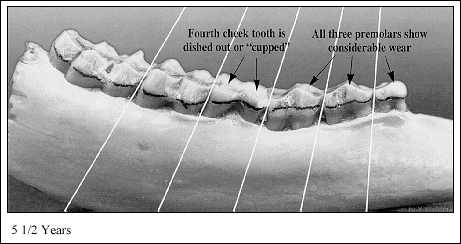 The science of aging deer is based on tooth development and wear. Like humans, deer replace their “baby teeth” with permanent teeth at a relatively set rate. As surely as a 6-year-old child will soon lose her two front teeth, an 18-month-old buck will be in the process of losing its third premolar. 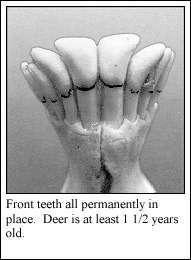 By the time a deer is 2-1/2; years old, all permanent teeth are in. At this stage, estimating age is based largely on the rate of tooth wear. Diet and soil types may accelerate tooth wear, but generally, estimating the age of adult deer is straight forward until they reach age 5-1/2;. Beyond that, estimating age by tooth wear is less reliable. These are the front teeth on a deer jaw. 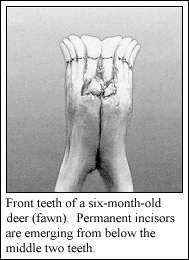 When a deer is 5-6 months old, the central two incisors are replaced. 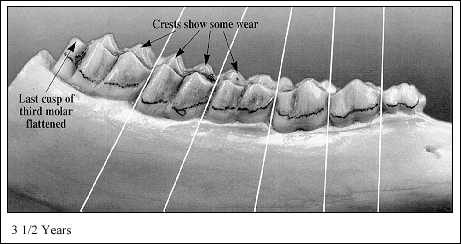 The rest of the front teeth -lateral incisors and canine teeth – are replaced during the 10th and 11th month. Unlike horses, deer do not have upper incisors. 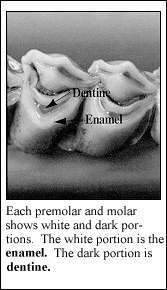 Premolars: The first three teeth on each side of the jaw are called premolars. 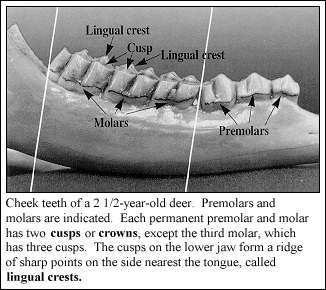 Deer grow two sets of premolars. 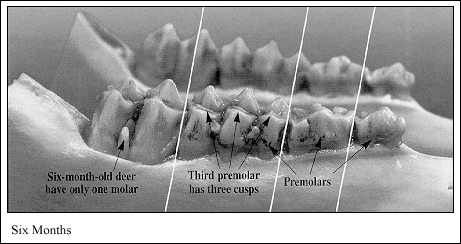 The first set appear in fawns and last until the deer is about 1-1/2; years old, when permanent adult premolars push out the baby premolar teeth. An important characteristic of the first set of premolars is that the third premolar has three crowns or cusps. When the permanent teeth come, all premolars have just two cusps. Molars: The fourth, fifth, and sixth cheek teeth are the molars. Deer only grow one set of molars. Generally, six-month-old deer have only one molar when they enter the fall hunting season. Therefore, six-month-old deer usually have only four cheek teeth. 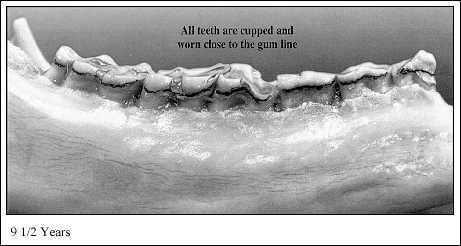 By 1-1/2; years of age – the second fall – the second and third molar have erupted through the gum, though the last cusp of the third molar may still be below the gum line. All six molars and premolars are fully erupted by 2-1/2; years. The vast majority of deer in North Dakota are 2-1/2; years old or younger. 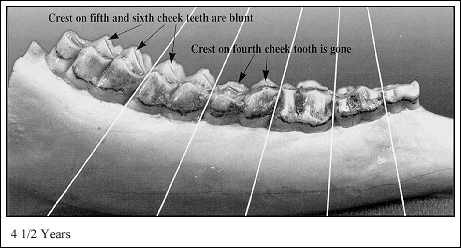 To determine the age of animals in older age classes we need to look more closely at tooth wear. 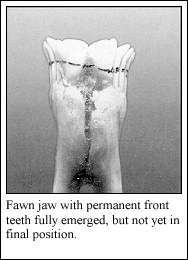 While it is possible to determine whether a deer is a fawn by looking at its incisors or front teeth, it is the cheek teeth, specifically those of the lower jaw, that harbor the most reliable clues. To get a good look at the cheek teeth (premolars and molars), you need to cut back the lip and cheek skin. If you plan to have the head mounted, let your taxidermist skin out the head and remove the jaw for you. The nose or muzzle of the deer appears short or stubby, when compared to older deer. The central two incisors may still be erupting. Incisors may appear twisted as they emerge through the gum. Generally, there are only four cheek teeth showing. The third premolar has three cusps. All permanent front teeth are in. Six cheek teeth are visible in the lower jaw. 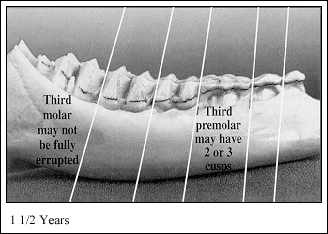 The third premolar may still have three cusps, or the permanent third premolar may now be in (two cusps). Third molar may still be erupting through the gum. 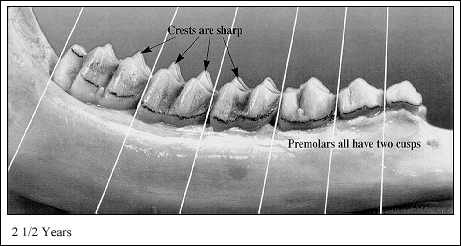 Lingual crest of molars have sharp points.Inset: Extremely worn third premolar may fool people into thinking deer is older. Actually, this tooth is lost after 1-1/2; years and replaced with a permanent two-cusped premolar. All permanent premolars and molars are in place. Look closely at the fourth cheek tooth (first molar). The cusps are sharp and show little or no wear; enamel (white portion) of the lingual crest shows well above the dentine (brown portion). The enamel portion of the cusp is wider than the dentine. 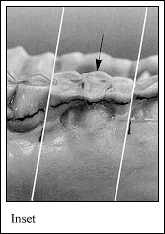 Some wear on third cusp of sixth cheek tooth (third molar). Jensen, William. 1996. How old is my deer? North Dakota Outdoors 59(4):2-6. Jamestown, ND: Northern Prairie Wildlife Research Center Online. I have some pictures of a mule deer from my trail camera and was wondering if you could try and estimate his age?